Textiful integrates with SalesForce and allows you to sync collected email addresses and other information to the SalesForce as Leads. First you will need to authorize Textiful to integration with SalesForce. Click the "Integrations" tab. Find the SalesForce section and click the link "Click here to integrate Textiful with your SalesForce account". 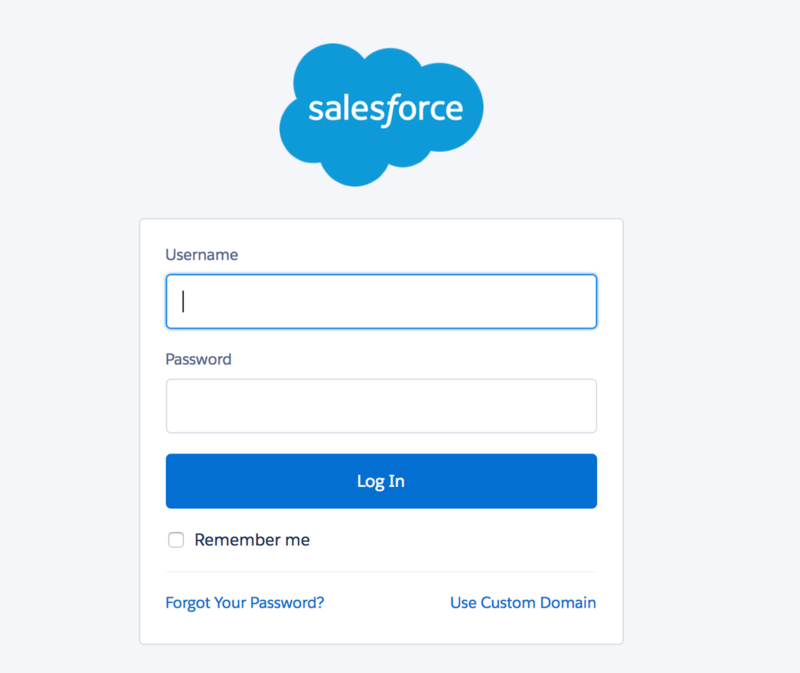 You will be taken to a page asking for your SalesForce username and password. Enter your credentials to authorize Textiful to talk with SalesForce. Once Textiful is authorized, you'll need to enable and customize how email addresses are synced to SalesForce. On the keyword details page in Step 3, check the "Sync collected email addresses to my email list" box. Below that check the "Sync Emails to SalesForce" box. If you do not see the SalesForce checkbox, click the "Add more email integration options" link to go to the Integrations page and follow the instructions in Step 1 above. Click the "SalesForce" tab in the left hand navigation to view all of the SalesForce Sync options. SalesForce requires an Email Address, Company Name & Last Name to create a new Lead. If your keyword is on the 444999 shortcode, you can ask for this information directly from your users when they enroll in your keyword. If your keyword is on the 345345 shortcode, it's not possible to capture this information directly from your users. You can use the Textiful Data Plus option or setup your options within the Handling Missing Data section. Textiful Data Plus uses the collected email address to match social media sites. It is recommended to use for keywords on the 345345 shortcode. Textiful Data Plus does not guarantee to find name and company information. It costs 2 Textiful credits per successful match. Credits are only charged if an email record is matched and data is found. This section has options which determine how to handle cases where either the Company Name or Last Name is missing from the user's data. You can set Textiful to always sync email addresses as Leads even if they are missing Company Name or Last Name information. If you choose this option, you'll need to set Default values that will be used when data is missing for a particular user. 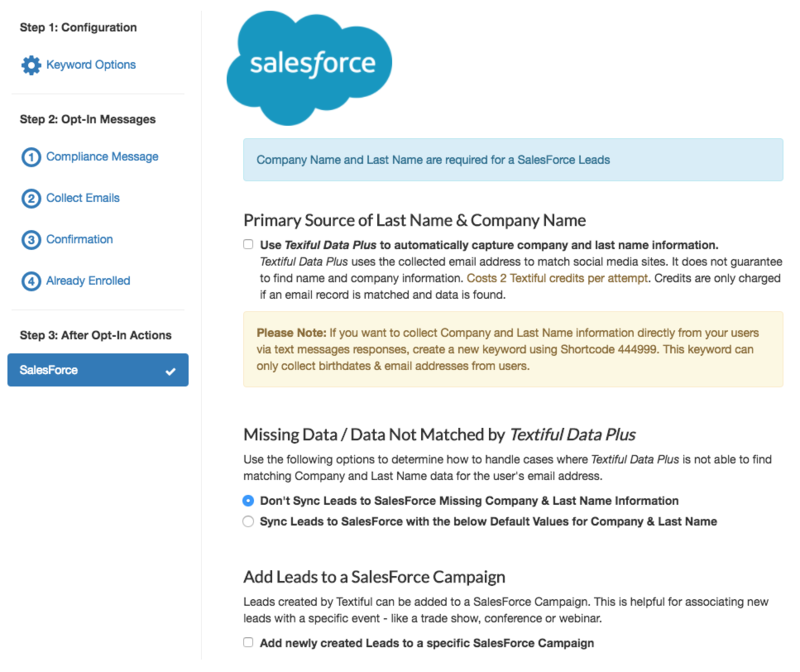 You can also add newly created Leads to a SalesForce Campaign. Just check the box and and select the desired Campaign and your new Leads will be added to the SalesForce Campaign.